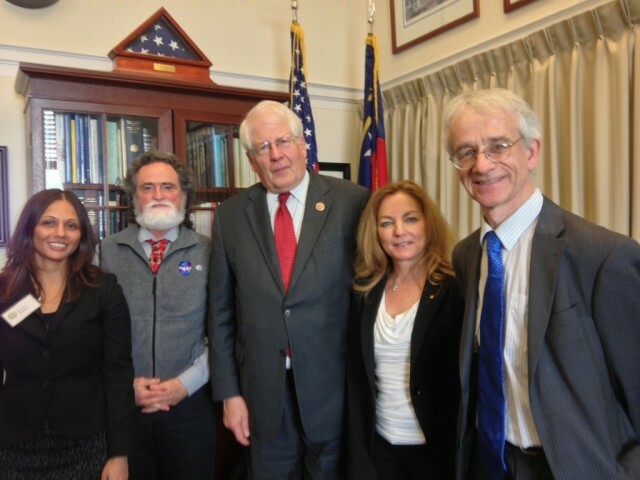 In February 2013, Director Susan Hassol traveled to Washington, DC for Climate Science Day on Capitol Hill. As part of an effort organized by 13 major scientific societies, Susan addressed scientists on how best to communicate the science of climate change to their representatives on the Hill. They then met with members of Congress throughout the course of one day for the purpose of “providing a non-partisan opportunity for scientists of many disciplines to build relationships and provide Members of Congress access to the best possible climate science information.” Susan, along with a team of scientists from North Carolina, met with members of Congress and/or their staff from both sides of the aisle: Sen. Kay Hagan (D-NC), Rep. David Price (D-NC), Rep. Richard Hudson (R-NC),Rep. Patrick McHenry (R-NC), and Rep. G.K. Butterfield (D-NC). Fifty scientists participated in this year’s event. Dr. Kim Cobb, of Georgia Tech, was one of the scientists attending Climate Science Day and subsequently met with several of her representatives. You can read her blog post on her experience–including a chance meeting with her congressman on the plane ride up–here.